What terminal/console mode alternatives to vi/vim and nano are available? I am looking for minimal, good looking and friendly text mode editor for complete newbies with PC. I remember I've seen somewhere a terminal editor that showed menu on Esc instead of cryptic (and somewhat ugly) ^X shortcuts an the bottom, but searching through GitHub I couldn't find it. UPDATE: It appeared that "friendly for complete newbies" requires more explanation. Let's take a common scenario when user tries to use vim for the first time (which is often set as a default editor). When vim runs with text to edit, there is no help displayed and typing produces strange results, so users hit Esc or F1 and it "doesn't work". 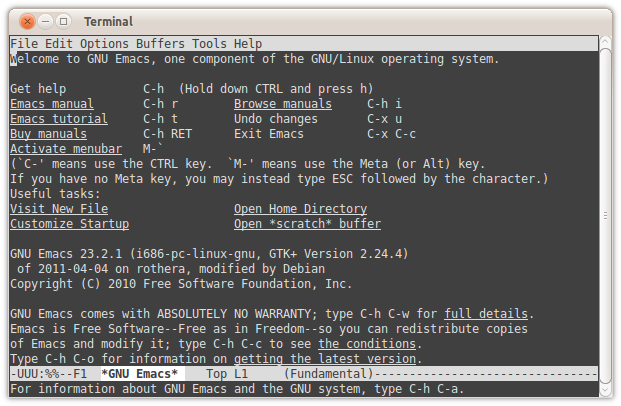 A friendly editor, for example, would show help on F1 key, contain menu system with highlighted shortcuts, provide syntax highlighting out of the box, and do that all by default. micro shows help on F1, implements syntax highlighting, exits on Esc. No menus, but supports plugins. Back in the 1990s many of my colleagues preferred Joe to either vi, pico or emacs. It is still considered by some as the most user friendly terminal based text editor. 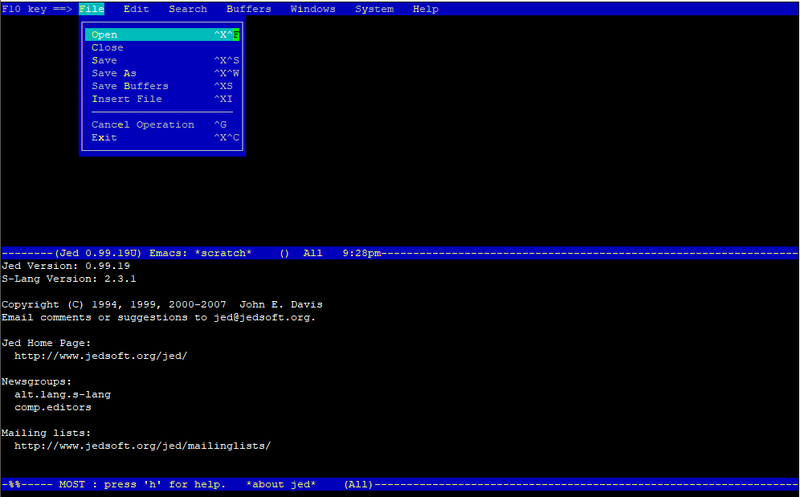 JOE is a full featured terminal-based screen editor which is distributed under the GNU General Public License (GPL). JOE has been around since 1988 and comes standard with many Linux distributions. While far from the minimalistic approach you request, Emacs is highly customisable. So, with a bit of work you can get it to behave in the most suitable way for you. To run it in the terminal you must use the -nw flag. If you intend to use it regularly you may create an alias. My best guess is, you're searching for the ne (the nice) editor. Shows an ncurses Menu when pressing ESC twice or F1 once. Pretty straight forward menu. Save, Save as... Quit etc. Can I also suggest 'jed' console editor, a bit like 'ne' in some respects with menus (accessible via F10), simpler overall (less fully-featured) and with a bit of colour. Not the answer you're looking for? Browse other questions tagged software-recommendation text-editor usability or ask your own question. How do I install the latest version of EMACS and pick the appropriate UI? Should I install the recommendations apt-get gives me when installing vim? Text editor with tabs and syntax highlighting? Gedit alternative?